Sitting is the New Smoking™. Whether you’re in the office, at home, or on the go, UtiliFIT is the fun way to get healthy activity throughout your day. Sign up to see how UtiliFIT can help you break sedentary habits to get more active and be healthier every day. 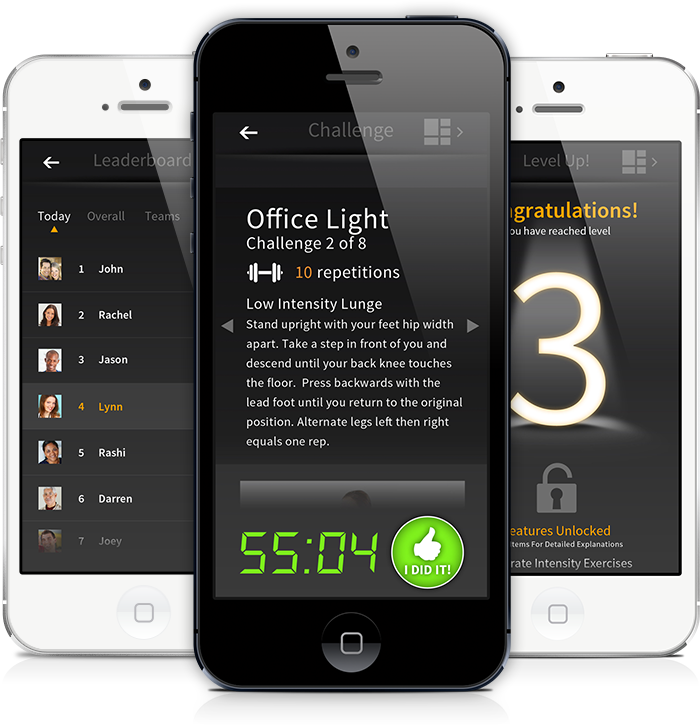 UtiliFIT is a daily fitness activity game that addresses the health concerns associated with sitting for hours on end. Read more on the dangers of sedentary behavior. Have fun doing something that’s good for you. An active lifestyle doesn’t have to mean boredom on the treadmill. UtiliFIT is the collaborative effort of video game nerds and health experts getting together to make healthy behavior change a fun, lively, social experience. UtiliFIT disrupts the negative health effects of prolonged sitting by sending you micro-physical challenges throughout the day. Most challenges take under 2 minutes, but the health benefits of small bursts of activity last all day. With office-friendly exercises, Yoga, and even Crossfit activities, UtiliFIT is designed with people of all ages, shapes and fitness levels in mind. UtiliFIT starts easy and intelligently gives you more reps and more advanced exercises as your performance improves. With scoring, time bonuses, player stat leveling, leaderboards, raffles and activity progress, you’ll swear it’s too fun to be good for you. UtiliFIT only gets more fun when you play with your friends or coworkers. A little friendly competition goes a long way! Sounds pretty cool, right? Scroll down or Sign Up to see what it’s all about. UtiliFIT runs on any internet connected device. We’ve designed UtiliFIT to work on all of your devices. Play UtiliFIT at work on your computer or take UtiliFIT with you on your mobile device. UtiliFIT features an ever growing catalogue of themed games designed by our world class trainers to challenge and inspire people of all fitness levels. Games consist of micro-physical challenges that are delivered to you throughout the day, and with over 200 activities that each feature beginner, intermediate and advanced difficulties, variety keeps the experience fresh. Friends challenge and inspire us… but it’s still way satisfying to beat them at things. 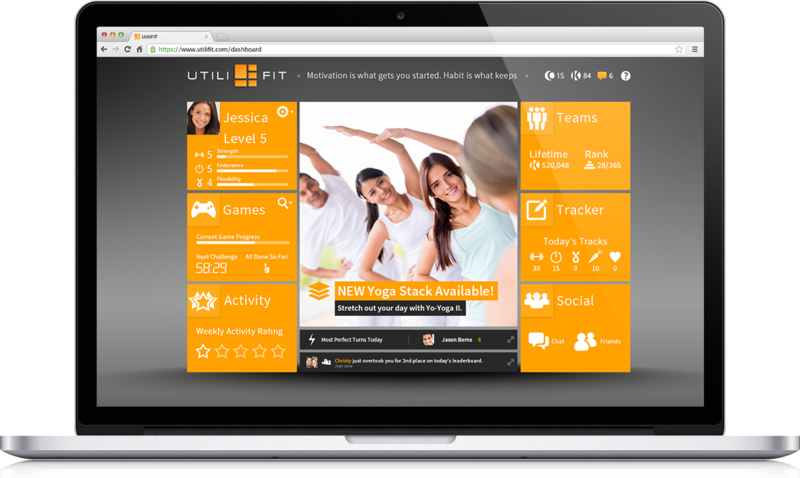 UtiliFIT is designed to be a social experience shared with friends and coworkers. Play in daily games together to compete for the top spot on the leaderboards and boost your Weekly Progress rating. 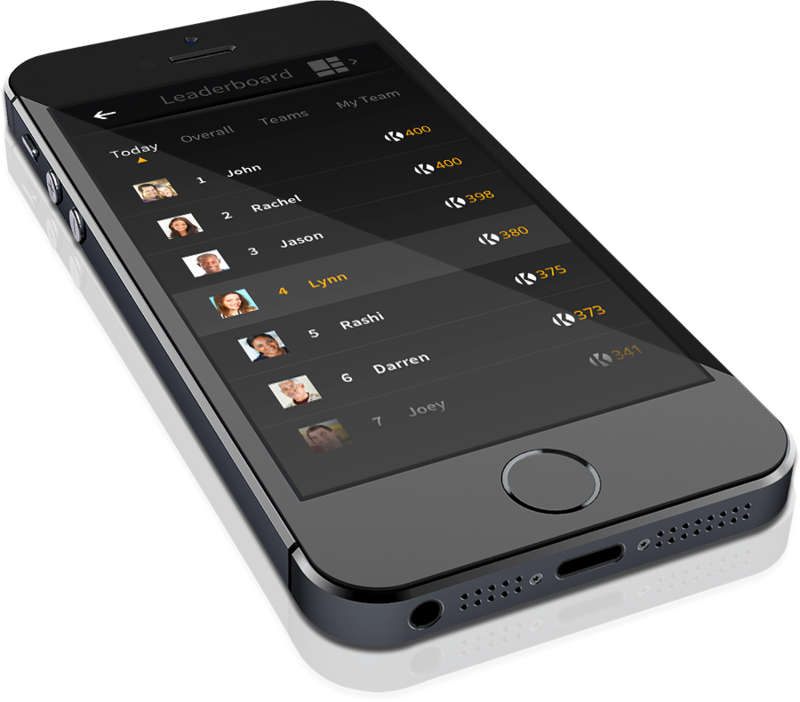 UtiliFIT smartly scales game challenges to your fitness level, allowing exercise novices to play along-side athletes in the same games and be competitive in the scoring and leaderboards. UtiliFIT is getting people out of their chairs all over the world. Get the latest on new features and healthy activity research in our monthly newsletter.